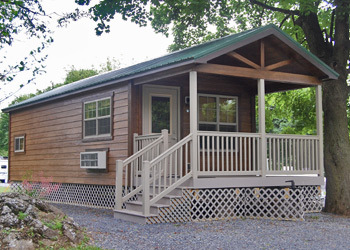 Western Village RV Park is located in Carlisle, Pennsylvania, the seat of Cumberland County. South Central Pennsylvania is steeped in history, and Cumberland County offers a unique blend of small town charm and big city sophistication. Whether you’re a history buff, an art lover, an outdoor enthusiast, or a sports fan, whether you want to sightsee, shop, dine, be entertained or pampered, you’ll find all kinds of interesting places to see and fun things to do. We are located just 30 minutes from the state capital at Harrisburg or the Civil War history of Gettysburg. We are also an hour (or less) away from Hershey (home of HersheyPark), Lancaster (and the world famous Amish Country), York (and the Harley Davidson Museum), and Hagerstown, Maryland. We are also only a three hour ride from either Atlantic City, New Jersey or Washington, DC. Rates based upon 2 adults and their 2 dependent children 17 and under, or 4 adults. Maximum of 4 persons per tent site (unless members of the same immediate family); only 1 tent per site. * Additional $3.00 per night, per site charge on designated holiday and car show dates. All sites: One night deposit. advance reservations are generally accepted for a one night only stay, and at the discretion of staff. Weekly Rate: Pay for 6 nights, get 7th night FREE! No other discounts apply. Discounts and specials cannot be combined nor applied to holidays. 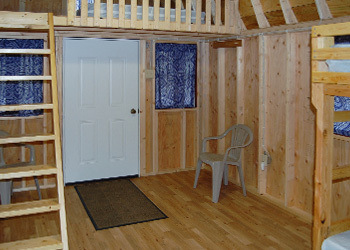 We offer 6 primitive loft cabins, with 2 of these being fully insulated with pine finished walls and ceilings. 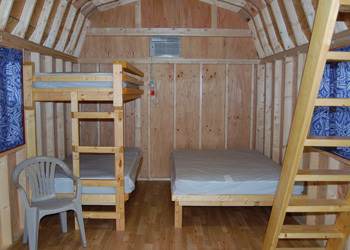 All cabins sleep 6 people and consist of 1 set of bunk beds with mattresses, 1 full size bed in loft and 1 below, with mattresses. (Linens are not provided in cabins.) There is a/c in all cabins, along with electric light and electrical outlet, and a porch with light, picnic table and fire ring outside. Water and bath house are nearby. No smoking or cooking is permitted inside of cabins, and no pets are permitted inside or outside of cabins. ** Additional $5.00 (plus tax) per night charge on designated holiday weekends and car show dates. Call for weekly cabin rates. Electric heater (cabins only): $3.00 (plus tax) per night. 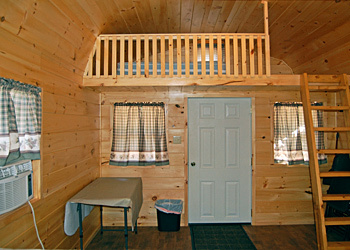 Rates for Primitive Loft Cabins are based on 2 adults and 4 children. 2 & 3 night minimum stays must be paid in full at the time of reservation. All others: One night deposit. 14 days or more notice: Full refund, less $10 processing fee. 7-13 days: Rain check valid for remainder of year, less $10 processing fee. 0-6 days: No refund; No rain check. Cancellations received more than 30 days prior to arrival receive full refund, less $10 processing fee. Cancellations received less than 30 days prior to arrival: No refund; No rain check. Arrivals before 12:00 Noon will be $20.00, if site is available. Check out up until 4:00 PM will be $5.00, if site is availble; after 4:00 PM is an additional night fee. Campers have until 10:00AM on the day following the initial arrival date to check-in. Otherwise a no-show will be issued and the site will be released. Our store and office hours vary by season, please call. 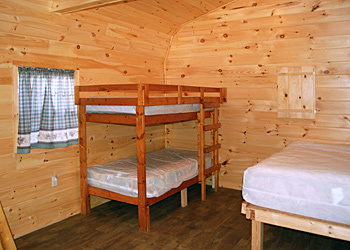 This beautiful full-service cabin features one bedroom with a full bed and 3 twin beds set up as bunks. Full size futon couch that opens into another bed. Sleeps 2 adults and 4 children or a maximum of 4 adults in the same camping family. *Pets and smoking are not permitted inside our cabins and will be cause for loss of security deposit. Nor can pets be left outside of cabins. Available mid-April through late October. 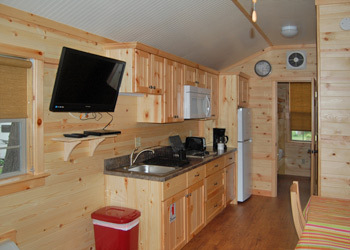 1 Bedroom Deluxe Family Cabin amenities include indoor plumbing, bathroom with shower, electric, heat and air conditioning, TV with DVD player, ceiling fan, kitchen appliances (2 burner electric stove top, refrigerator, microwave, toaster, 12 cup coffee maker [filters not included]). Serving items for 6 people: Plates, bowls, mugs, plastic drinking cups, forks, spoons, knives, basis non-stick pots & pan set with plastic non-stick cooking utensils. Miscellaneous items: dish drainer, plastic measuring cups & spoons, small cutting board, and basic can opener. Dining table with benches and chairs. Outside fire ring with grate. Picnic table. Please bring your own supply of linens, pillows, blankets, towels, personal items, and kitchen linens such as dish towels and hot pads. Deluxe Family Cabin have a 2 night minimum on all reservations and a 3 night minimum for Holiday weekends. One night deposit is required at time of reservation, less PA Sales Tax to be collected at check-in, along with a $5.00 cabin key deposit returned at check-out. A valid credit card must be shown at check-in for security deposit. Due to having one deluxe cabin, there will be no refunds issued unless a 30 day notice is provided. In such cases, a $30.00 processing fee will be applied. Cancellations received 29-14 days will receive a credit valid for the remainder of the camping season, less a $30.00 processing fee; under 14 days, no refund/no rain check. Arrivals before 11:00 AM, 1/2 day fee; after 11:00AM $5.00 per hour. Early Check-In / Late Check-Out fee $5.00 per hour until 4:00 PM. After 4:00 PM, additional night (based on availability). © Western Village RV Park. All rights reserved.